Last week, my neighbor shopped for, financed and purchased a new car – all from his laptop. The company delivered the car right to his driveway. Not long ago, I would have said that’s crazy. But today, we’re all getting used to expecting the experience we want how and when we want it –­ from cars to music to customized skin-care labs. For example, Nike allows you to create your dream shoes in-store and take them home in 90 minutes. 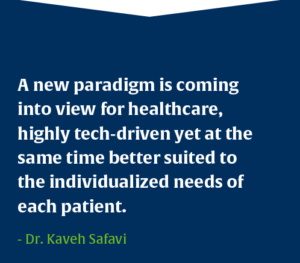 Healthcare is now at the heart of this personal approach to business by becoming customized not just to certain populations or groups but to the individual. More than 30 percent of new drug approvals last year were “personalized” medicines. PT clinics that recognize this and see the opportunities in this highly competitive market will have the edge, but it requires some serious re-thinking. How do you create the most personalized experience for your patients and the most profitable experience for your clinic? These days, competition is fierce. Days are packed. Time is short. But getting new patients and retaining your existing ones are both at the heart of your business’ ability to grow and thrive. How do you help patients experience the value of what you do before they actually come to your clinic? How are you quickly engaging patients ­– addressing their wants, answering questions about treatment, payment and insurance options? How are you leveraging the power of that personal connection between your PTs and patients beyond the four walls of your clinic before, during and after their treatment regimen is completed? The average patient has no idea why your facility is a better option – or why a PT is an option at all in treating their injury. Yet most advertising methods are expensive and discouraging to clinic owners who don’t have deep pockets or the time to do marketing. Also, according to the U.S. Department of Health & Human Services, only 30 percent of patients will attend all the visits their insurance company authorizes, typically 7-10 sessions. The result? The average outpatient PT clinic loses out on nearly $250,000 of revenue per year. With the In Hand Health app, you can more profitably succeed in answering and solving those challenges. Cost-effectively promote your practice and educate your audience in a custom-branded app. Engage potential patients with information that is nuanced to specific mindsets, needs or events. This allows you to drive them to content they value, created by you on your own branded app. You can also empower potential patients to interact with your PTs inside the secure messages section, creating early, personal engagement. Be the clinic that delivers the holistic, personalized experience that patients want. It can be up to five times more cost-effective to retain an existing customer than to acquire a new one, yet only 18 percent of companies put their primary marketing focus on customer retention. 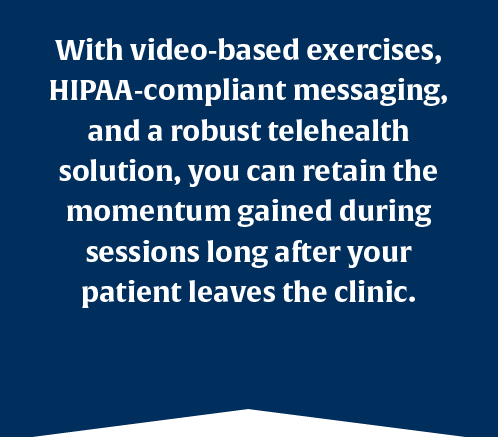 With video-based exercises, HIPAA-compliant messaging, and a robust telehealth solution from In Hand Health, you can retain the momentum gained during sessions long after your patient leaves the clinic. And when managed wisely, this app can minimize costly drop-offs, treat more in less time, and grow revenues. Extend the value of your PT/patient relationship with a subscription-based model that generates above-and-beyond revenue. In general, existing customers are 50 percent more likely to try new products and spend 31 percent more when compared to new customers. In Hand Health Continuing Care™ gives you an optional e-Commerce service that further personalizes your connection with patients. That’s a big deal for the more than 90 million Americans who rely on rural hospitals. According to U.S. Physical Therapy’s May 2018 Investor Presentation, there are an estimated 16,000 to 18,000 outpatient clinics, with no single provider owning more than 10 percent market share in the outpatient industry. Many clinics are looking at alternative methods of bringing money into their practice because the one-size-fits-all approach is quickly becoming a thing of the past. You can put your clinic in a position to succeed by engaging, educating, and empowering patients with a more personalized experience at every touch point. The future is clear, and In Hand Health can put you a perfect position to lead the way. 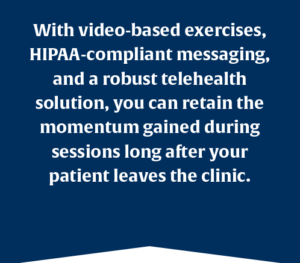 Get your PT clinic on the path to personalized healthcare today. Mike Gassman is the founder of In Hand Health, an app-based software solution helping PT clinics thrive on three things: creating a dynamic patient experience; strengthening the relationships between PT’s and patients; and increasing profitability. Share your thoughts about how PT clinics can develop a personalized experience on our Facebook and Twitter.